What could be a more important and relevant subject in today’s world than English? The skills students learn in their English classes go on to last them a lifetime, granting them the ability to not only express their thoughts coherently but to decipher the words of others, as well as learn how to think critically about the world around them. As a budding English teacher, it will be your job to impart all of these important skills upon your students—after you prove yourself capable of the task. In the state of Oklahoma, simply completing your teacher’s training courses isn’t enough to qualify to step foot in the classroom. You’ll also have to knock out one last requirement: taking and earning a passing score on the OSAT English exam. You may already be familiar with the OSAT and its purpose, which is to assess how ready you are to enter the teaching world professionally. However, you may not feel nearly as familiar with the exam’s contents. It can be nerve-wracking to have such a significant final step ahead of you, but not know how to approach it. 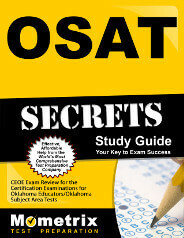 On the exam, you’ll find a total of 81 OSAT English questions. These questions divide into two answer categories, one being for essay answers and the other being for multiple choice. The first category, known as “constructed-response,” accounts for 15 percent of the test’s contents and covers the Pedagogical Content Knowledge subject. 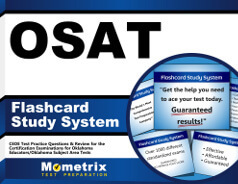 Feel free to utilize this free OSAT English practice test as you study for this important exam. While it works best in conjunction with our companion study guide, it also proves effective when used on its own. No matter how you use it, we hope it will become a helpful component of your study plan. Good luck!